"Painting on Paper: American Watercolors at Princeton"
In an age that favors large-scale installations and immersive art, when painting itself has been declared dead many times and, when practiced, is often judged to be hackneyed, the humble watercolor rarely figures at all in conversations about art. 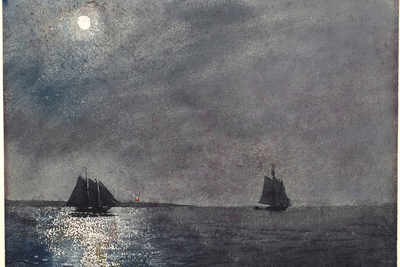 It was in the late 19th century, especially between 1870 and 1885—when artists actively promoted the medium and the American Watercolor Movement thrived—that watercolors hit a zenith. Yet well into the 20th century, museums regularly staged watercolor shows; the Brooklyn Museum actually held biennial International Watercolor Exhibitions, showcasing new ideas and trends, from 1923 through 1963. There are still shows of watercolors by geniuses like John Singer Sargent and the occasional broad survey. But somewhere along the way watercolors picked up an association with amateurs and lost their appeal for many professionals. How regrettable. Using watercolor paint, with its transparent quality and unruly fluidity, is treacherous and unforgiving—the opposite of easy. Unlike oil paint, it does not allow cover-ups of mistakes or midstream changes in design. Yet in the hands of masters, watercolors—as the summer exhibition at the Princeton University Art Museum demonstrates—can deliver brilliant works that hold their own against art made in other mediums. "Painting on Paper: American Watercolors at Princeton," a refreshing but uneven survey of 200 years of watercolors in the U.S., starts strong with a masterly work by Charles Burchfield, "Summer Benediction" (1948). 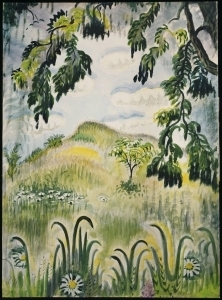 Burchfield painted almost exclusively in watercolor, producing inventive views of his subjects—in this case, a dreamy landscape with white, yellow and pink wildflowers beneath a light blue sky and cumulus clouds, framed by the dark green leaves of an unseen tree that give the picture depth. "Summer Benediction" conjures up a warm, lazy afternoon, hinting at the blessings of the earth, but is much lighter in tone than some Burchfield paintings, which are spiritual meditations with overt mystical or religious references. It is watercolor at its best—layers of color in assured brushstrokes and patches of unpainted paper that create highlights. This luminous image, then, neatly leads to the exhibition's introduction, a short primer on the technical aspects of the medium. A text explains how artists use finely ground pigment in a gum arabic solution that yields that transparency, and how they pile up washes to turn light colors into dark, all the while avoiding the bleeding of one color into another. Along with pure watercolors, artists may use gouaches, made with the same pigment but incorporating white chalk or paint; but with gouaches, artists apply dark colors before adding successively lighter ones to produce opaque, matte works. Two pictures here illustrate the difference: John James Audubon's delicate watercolor, "Yellow-Throated Vireo" (1827), and Morris Graves's gouache, "Antelope" (1930-39). With that lesson out of the way, the exhibition of about 90 works proceeds chronologically and thematically. It takes visitors from early 1800s American landscapes, usually of specific locations, through early figurative works, folk art images, later landscapes and figure paintings that are more detailed. Then come complex, modernist confections, urban realism and post-World War II works, including some abstractions. It introduces some unknowns, and lesser-knowns, into the company of such exemplars of the medium as Maurice Prendergast, Edward Hopper, John Marin and Andrew Wyeth. Mary B. Tucker, who is thought to have worked near Concord and Sudbury, Mass., likely painted an early gem, for example, the unsigned "Girl in Calico" (c. 1840-1850). In a half-length portrait, a serious young girl exhibits pellucid skin, wears her long hair in perfect sausage curls, holds a book, and stares at the viewer with almond-shaped eyes. Her dress, with stripes made of brown and blue daubs, flows from the artist's brush a bit less fastidiously, a common practice in portraiture of the times. Contrast that with the charming baby picture "Mehitable Eddy ("Hetty") Taber" (1830) by the less accomplished Deborah Smith Taylor (1796-1879). In her folksier style, the child is dressed in a meticulous bare-shouldered, full blue dress, but her head and hair are sketchier and the artist lets the woven paper stand in for flesh. Before too long, watercolors had evolved to allow more ambitious works, such as the marvelous little "Three Eggs" (1868) by Thomas Charles Farrer. 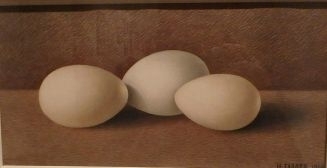 A British-born follower of John Ruskin's diktat—to be "true to nature"—Farrer renders perfectly modeled eggs, of slightly different sizes and shapes, on a plain beige counter against a plain tan background, both formed by tiny visible brush strokes. Bare simplicity is rarely so beguiling. Aside from Burchfield—whose bleaker work "December Fields" (1932) is here as well—the brightest star in "Painting on Paper" is no surprise. It's Homer, who also has two works on view. In 1875, two years after he took up watercolors, he painted the undistinguished (for him) "The Trysting Place," a pretty girl holding a Japanese fan. "Eastern Point Light" (1880), on the other hand, is dazzling. This evocative symphony in blue and black and white shows two ships at sea, one backlit by moonlight and the other at the right in comparative darkness. On the distant shore is a barely discernible red beacon. Here, Homer employs several techniques to go beyond the ordinary. To make his haloed white moon, he probably scraped the paper clean with a knife (or thumbnail). To create the reflection of moonlight on the water (and texture), he gouged out damp blue pigment with the end of his brush. At times, he probably used a fairly dry brush to spread pigment quickly and unevenly, allowing bits of white to show—in the stars, for example. This exhibit is flawed, though. Because the works on view are mostly drawn from the university's own collections, some masters of the medium are present with weak pictures. I longed to see one of Charles Demuth's flower or architecture watercolors, for example, instead of his sketchy "Trees, No. 2" (1916), and for better works by Prendergast, Arthur Dove, John LaFarge and a few others. Nonetheless, "Painting on Paper" is gratifying, its shortcomings offset by the very fact that it exists.